After the Death Tarot Card and the Devil Tarot Card, The Tower Tarot Card is often the card that causes most fear and consternation in people who are having a reading done. It’s very hard to find a positive side to this card. This card however, does tell you that the unexpected shock and dramatic change due to events will create new opportunities. Therefore you can try to look at this tarot card positively in a way that will make you a stronger and wiser person. The Tower represents sudden and sometimes shocking changes in events and can often represent problems or delays relating to your home or the purchasing of home. Whether material or emotional upset, this card encourages you to see that such upheavals can force new directions that can be more beneficial. Negatively The Tower represents unecessary suffering. You may be falsely accused of something and suffer some form of imprisonment or isolation, or you may be the one causing the shock and change with a rebellious attitude. The main thing to remember with this rather unpleasant card is that this phase will pass and that a new direction or new opportunities can be created from it. The Tower Tarot is the sixteenth Major Arcana or trump card in the tarot series of cards. This is a card that is often used as a means of helping to identify many different points relating to the future of one’s life or at least some of the meanings that one might utilize in one’s life. It may be used as a means of analyzing one’s future and how the path to enlightenment is going to work for one’s life at large. This is a card that specifically focuses on the the changes that may come in one’s life. In some cases the changes that one will experience will end up being sudden and dramatic but in other cases there might be a sign of a fear of being able to change. Also, it can be a real tragic or positive sign depending on the way how a person sees the card. The card may still be used as a means of helping someone to understand what can be done as a means of trying to fix one’s life in order to make it a whole lot easier for the changes one has to make to be completed in order to have a much healthier and more positive life in one’s community at large. 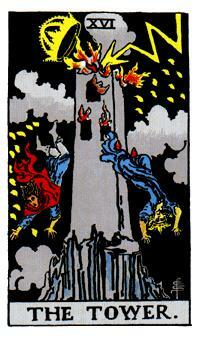 The appearance of the Tower Tarot gives it the appearance as though there is a disaster going on. The Tower Tarot is on top of a mountain while lighting strikes it. Fire can be seen coming from the windows. There are also two people who are leaping away from the tower as a means of getting away from the destruction. The Tower Tarot is symbolic of physical destruction. In particular, the lightning bolt that strikes the Tower is representative of how new change is going to come along to destroy the old attitudes that were held long ago. The bolt appears to be heading in a direction that goes from the heavens and into the spiritual world. The two figures that are falling from the Tower are symbols of the consciousness that comes from the lightning bolt. They are escaping and fleeing the prison that they were held in and are looking to spread new change and wisdom to many places all around the world. There are also twenty-two flames surrounding the tower. They are symbolic of the twenty-two Major Arcanas. The flames are particularly shaped like the Yod, a letter in the Hebrew alphabet. The Yod is a symbol of humility and of one’s general belief in a higher power that will do good for all people in the world. Finally, there are some gray clouds around the card. These clouds are symbolic of the sorrow and misfortune that often comes about in life. An interesting part of this card is that it holds a different appearance depending on the origin of the card deck being used. Some European tarot cards will symbolize the Tower Tower with a tree instead of a large tower building. Some people like to see the lightning bolt on the Tower Tarot as a sign of intelligence. That is, the bolt is seen as a sign of the changes that are to be made in one’s life as a means of fixing problems in life and going forward. It establishes a sense of inspiration as well. The intelligence that comes with this is heavily based on what a person who draws the card is going to do with one’s life. If the right moves are made in one’s life then it might be a little easier for that person to move forward and become far more proficient and beneficial to others in one’s life at large. It is often easier for people to fully understand what they have to do in order to have better lives. The two figures on the Tower Tarot card are particularly related to the Devil Tarot card that comes right before this one. This can be interpreted as a sign of the desires to get away from the addiction, materialism and other sins that the upright Devil Tarot card might hold. The Devil Tarot card is clearly going to be different from the Tower Tarot card in terms of what it means and how it entails different functions in one’s life but it can certainly mean a big difference in one’s life if it is used the right way and with more than enough care. The meanings that come with the Tower Tarot card when it is upright often suggests that something alarming and surprising is going to come into one’s life over time. The Tower Tarot suggests when in its upright position that something alarming is going to come into one’s life and change things altogether. This dramatic change in one’s life might be a sudden event where any semblance of peace that one had is destroyed. In some cases it is going to be symbolic of a time of uncertainty where one is unclear as to what is going to happen in one’s life over time. The card may also be symbolic of the future fear and grief that may come about as a result of a sudden event. However, this card may also be used to explain that the best way to reach enlightenment and to have a better life is to think about one’s attitudes or viewpoints. This includes understanding how one’s behaviours work and how they must be changed in some way in order to move forward and become a better person in society. In some cases it might be a sign of a need to make some dramatic type of change in one’s life in order to really go forward and to become a much better person in one’s life in general. It can really show that there’s a truly need to make some changes for the better in order to really get somewhere in one’s life. The destruction of the Tower as it is upright may be a sign of revelation and creation as well. It means that there is a need to make a change in one’s life and that there is a new way to make such a change thanks to the new attitudes and values that might be established in the overall process. There will be a sign of real upheaval in one’s life as new things are built out of what had been destroyed or at least in place of what was originally destroyed. If the Tower Tarot card is in its reversed position then it will mean that the card is a sign of how a person is afraid of changes and is not willing to take risks. That person is working too hard to try and avoid serious disasters from coming about. To make things worse, the card is also a symbol of the way how the person may not be all that brave or willing to go forward with new things on one’s life. However, it may also be a sign that a person is aware of the fact that some kind of change has to be made in one’s life. It just may be that the person is too fearful to actually take the next step and make that dramatic change. This can include some form of change that may actually be worthwhile in the long run. Sometimes the reversed Tower Tarot card may also be a sign of a person having some kind of plan to use in order to move forward and go ahead long into the future. There is going to be some kind of time to prepare for such a major event as it comes along. This sense of preparation may be utilized as a means of trying to establish some kind of support for new things that may come along well into the future. The challenge of preparing for something can be a tall task for some but if the Tower Tarot card is dealt in a positive manner then it is often easier for the person to receive the necessary preparations that one requires in order to have a better life at large. The Tower Tarot card might sound on the surface as though it is a card that is going to be rather risky and dangerous to the lives of those who draw it. However, it can also be a positive sign in some cases. As difficult as the changes may be in one’s life and the way how they might be rather sudden to some, the Tower Tarot card may be a sign of how a person has to make different moves in one’s life for the best. It is not always the easiest thing in the world to bear with but it is a point that needs to be explored. If the Tower Tarot card is utilized properly then it should be rather easy for people to get better ideas of where their lives are going to head into and what they can do in order to improve their lives in general.